Designed for keepers of small flocks, each packet of Sav-A-Chick Electrolyte and Vitamin Supplement mixes into 1 gallon of drinking water. Formulated specifically for poultry, the balanced electrolyte formula supports hydration during hot weather or other stress, and is fortified with vitamins A, D, E, C, and seven B vitamins, all essential for proper growth and health in birds. 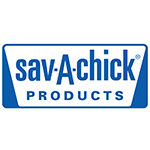 Use alone or with Sav-A-Chick Probiotic Supplement.